The city capital was reshaped by the grandiose work ordered by Napoleon III and carried out by Haussmann. Cut out in medieval Paris, large thoroughfares were created, among them the Grands boulevards with their numerous theatres and cafés. The arch was erected to commemorate the glorious victories of Napoleon’s Grande Armée. It si a superb and grandiose way to terminate the Champs-Elysées. There are somme painters who are easier than others to define. Eugène Galien Laloueis particulary difficult in this regard. I know of no other artist who worked under so many pseudonyms. Even major reference books like the “Benezit” show his pseudonyms as if they were different artists. 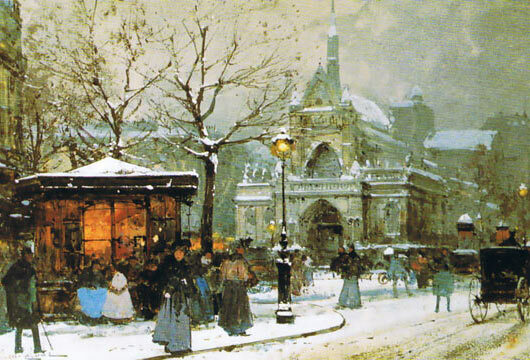 Eugène Galien Laloue contributed to this confusion himself, covering his tracks well, perhaps because he had an exclusive contract with a major gallery. After long and tedious research into various administrative and civil records, regional and national archives, museums, salons and exhibitions catalogues we can today confirm that J. Lievin, E. Galiany and L. Dupuy are all pseudonyms used by Eugène Galien Laloue. We may have used upon occasion other names, as well. 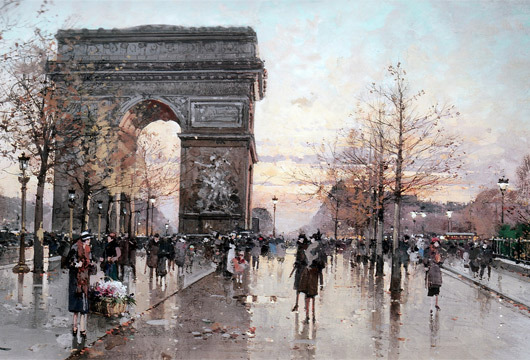 Eugène GALIEN LALOUE – "Le Triomphe de PARIS"
Eugène Galien Laloue painted Paris over a perod of fifty years! He was an eyewitness to the changing appearance of the city. Let yourself be carried away through the Paris of the Belle Epoque, so beautifully painted by this talented artist and depicted by so many writers, as fascinated as he by this magical city of lights. "The Grands Boulevards! So much life in two words !" marvels André Warnod. Sarah Bernhardt ran the Théâtre de la Renaissance where Hugo and Musset works were performed. He was a loner who worked with tenacity and rigor, qualities that served him well when he was hired by the railway administration to make a visual record of the rail track that was being laid from Paris to the provinces. Of course at the same time he was painting the surrounding landscapes and country scenes as well. 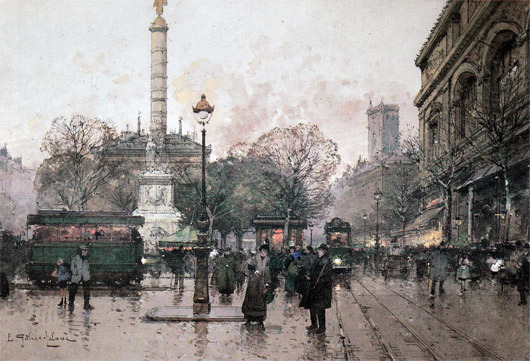 Eugène Galien Laloue was undoubtedly a talented artist. The different signatures he adopted reveal how he could depending on his mood, rank among the greatest marine or Barbizon painters, or even amongst the impressionists. The foundations of this pilgrimage basilica were laid in 1875 at the highest point in Paris. It was financed by public subscription and completed in 1912. For almost 2000 years Paris has grown along the banks of the Seine. The old Lutetia, the ancient capital of the Parisii,was bon on what is now the Ile de la Cité, an easy crossing point on this bend in the Seine. The left Bank was first inhabited, then in mediaeval times the Right Bank was drained and houses were built. The Banks of the Seine have been ever-changing throughout the years – and no less than 34 bridges now link the two sides of the 13 km stretch of the river. Mr. Noe Willer - owner of an art gallery in Paris and consultant to French auction houses. Certificate of authenticity Pour obtenir un certificat d’authenticité, dans un premier temps nous envoyer une photo de l’œuvre, son support, ses dimensions, ainsi que tous les détails : provenance et origine. Copyright © 2019 . All Rights Reserved. Designed by www.abc-site.com.